Here's another shameless plug for Harmonic Experience. I've studied a lot of music with many great teachers. There are lots of good ideas out there. 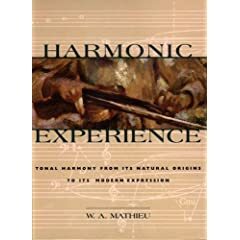 In his 'rosetta stone of music', Harmonic Experience, however, Mr. Mathieu boils music down to its essence. This book is way more fun than George Russell's dull, dogmatic, and dimwitted 'Lydian Chromatic Concept' and is a lot more useful than Schenkerian Analysis will ever be for this guitar picker. When does W.A. Mathieu get his MacArthur Genius Grant?